VIX hasn't traded above 20 for 200 consecutive trading sessions! While this streak is pretty amazing, it doesn't even come close to the tranqility we saw leading up to the financial crisis more than 12 years ago. Leading up to the financial crisis, the VIX had an amazing streak of 463 consecutive trading sessions where it didn't trade above 20! This streak lasted for almost 2 full years! We're in a rather peaceful market right now. This VIX streak clearly shows that. Can this tranquility last? 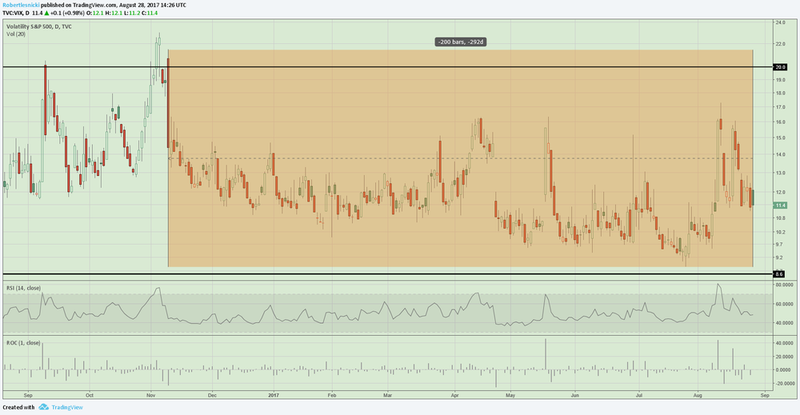 Sure it can last longer than anyone thinks, but with a near record short interest in VIX futures, my money would be betting that we see the VIX above 20 sometime before the year is over.